On May 11, three days after Argentina secured a $50 Billion IMF bailout - the largest in the fund's history - we jokingly noted that with the peso resuming its slide, an indication the market did not view the IMF backstop as credible, the ECB would need to get involved. 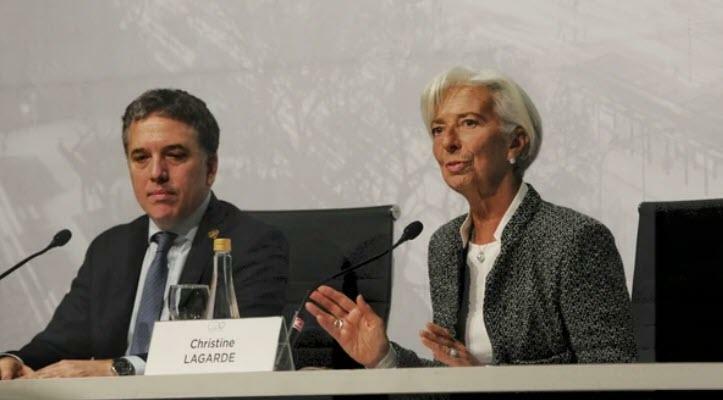 ... Christone Lagarde had even more bad news for Buenos Aires and Argentina president Mauricio Macri: the IMF now insists that after burning through billions in central bank reserves, Argentina should stop using funds to support the peso, and float it freely. 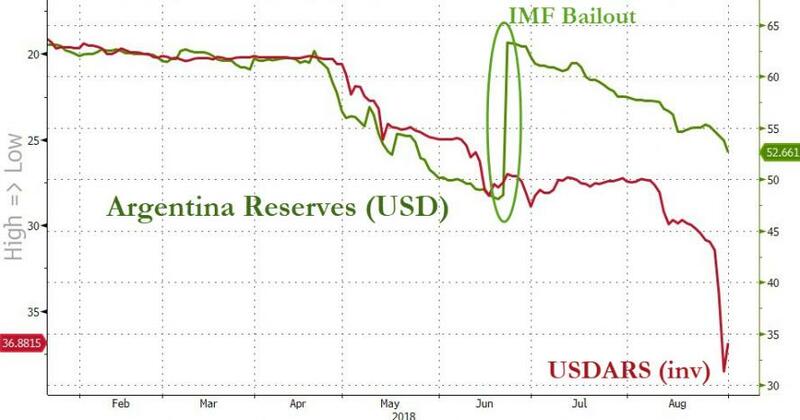 According to Infobae, the Argentine foreign currency reserves have declined below the level demanded by the IMF, with Argentine authorities selling $2.5BN to support the peso in August; meanwhile the overall level of reserves has slumped even more, approaching the levels before the IMF bailout while failing to prop up the currency which, as shown below, has collapsed in a move reminiscent of what is taking place in hyperinflating Venezuela. 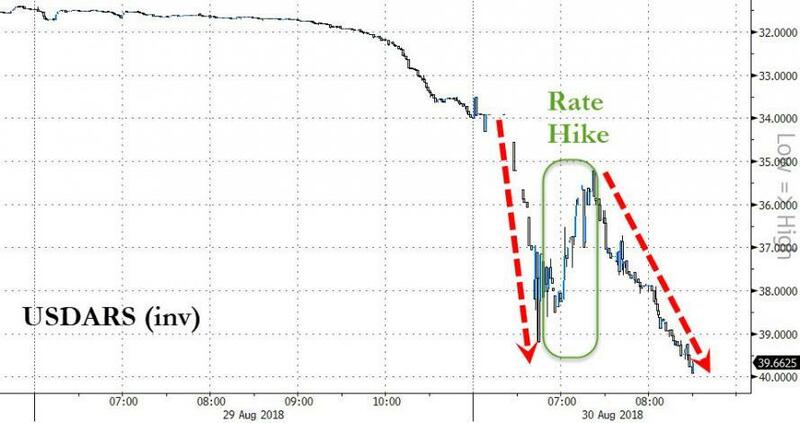 Worse, the Argentine Peso suffered its latest sharp drop in the days after the central bank unexpectedly hiked rates to 60% - the highest in the world - and another indication that the market is firmly convinced that not even the IMF backstop will force Argentina into a painful, and politically destabilizing structural program. After all it is less than two decades after the IMF tried the exact same playbook with Argentina and the result was a default. Meanwhile, as the IMF tells Argentina to let the peso "drop dead", fears of an economic depression are growing, and as Infobae notes, "unable to defuse the bomb left by the Kirchner regime, the government now faces the obligation to make a painful structural adjustment , as has happened so many other times in Argentina. Everything that the government wanted to avoid with its gradualist policies was ushered in by the market: mega-devaluation, high inflation and a collapse in purchasing power" as IMF enforces another round of austerity in Argentina; the same Argentina which defaulted the last time the IMF was in charge. The result, Infobae laments, is well known: "a fall in activity and increase in poverty." Even before the IMF shift, the administration of Mauricio Macri was preparing to implement the painful measures, with TN reporting that after a seven-hour meeting with advisers on Saturday to discuss currency crisis, Macri would raise export taxes to take advantage of the one silver lining from the collapsing currency, a boost to Argentine exports, and close 10 to 12 ministries, including Science and Technology, Culture, Energy and Agro-Industry. The president would also remove deputy Cabinet Chiefs Gustavo Lopetegui and Mario Quintana. Of course, the export taxes mean that much of the peso devaluation will be offset by the government taking its own pound of flesh, as per IMF instructions. Here Infobae does not mince its words, warning that the result of this tax reform will be disastrous, as next year the tax pressure will increase again, instead of falling, and will add further pressure on the exchange rate that in less than three months has left the country in the middle of a deep recession. The deterioration is so great, the publication notes, that all the government can do is hope to avoid a "knock out blow", and another sovereign debt default. Now event are set in motion that would result in a new default, which would not only have tremendous consequences for an already weakened economy, but also pose a big question mark how president Mauricio Macri reaches the end of his term. Meanwhile, further pressuring the economy will be the "strong fiscal adjustment" that will be enacted per IMF instructions in 2019. "Start with 0" , explained the Government when asked how it will achieve a fiscal balance. That would mean not only higher taxes, but slashing spending, and a wave of popular unrest and political chaos. As Infobae predicts, the 1.3% primary deficit is now a thing of the past, and the government is hoping to reach levels between 0.4% and 0.5%, "a fiscal goal that is as ambitious as it is difficult to meet." But while the government agrees with the IMF on the need to launch a highly unpopular fiscal adjustment, it certainly disagrees on the IMF's demands that Argentina reserve be used exclusively for the payment of the debt; here the Government insists on the necessity to have flexibility to intervene in the exchange market when it is necessary. And this is where the IMF's unexpected order to stop intervening in the peso came in: there were heated discussions between the staff of the IMF and the president of the Central Bank, Luis Caputo, as the IMF "bureaucrats" were alarmed not only by the rate of rise of the dollar, but by the loss of reserves, Infobae reports. 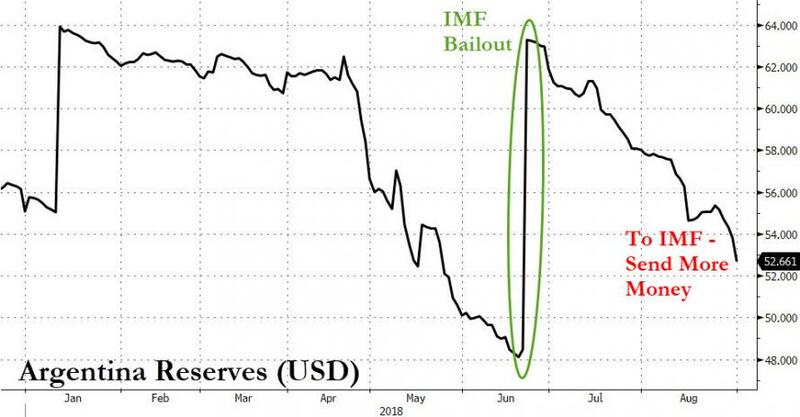 Specifically, the IMF is alarmed that in August alone, Central Bank reserves fell by $5.3 billion, from $58 billion at the end of July, to just $52.7 billion one month later. This level is $2.5 billion below the goal of reserves that the IMF had "instructed" the Government to keep by the end of September; this has been seen as a "flagrant breach of the commitments promise to Washington", as the terms of the agreement did not even last three months. A big reason for this slide is that, as noted above, the Central bank was extremely active in the market, supporting the peso even as it plunged, and intervened through a series of tenders: throughout August, it sold almost $2.5 billion, even as the peso lost over a third of its value in August. This prompted the IMF to insist on its original idea: the dollar must float freely, the price of the currency must be fixed by the market, and in addition, the Fund's loan should not be used to finance the flight of capital." The message is clear: if investors want to buy dollars, make it very expensive for them to do so. 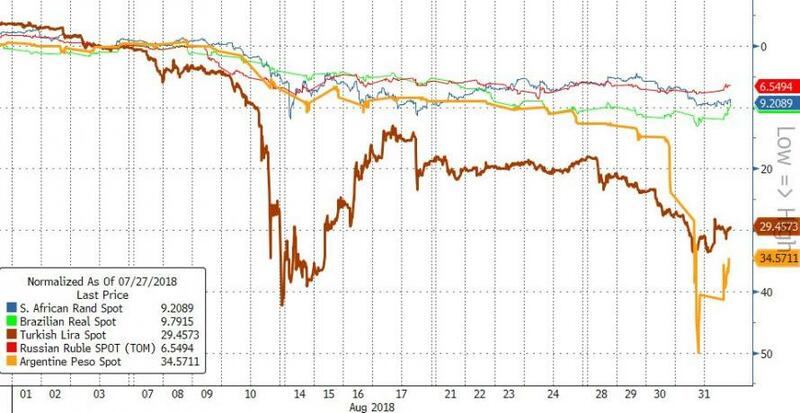 The bigger problem is that the Argentina Central Bank has already lost control: last Thursday, the dollar soared from $34.50 to $42 against the peso, underscoring the fragility of the exchange policy, because even as the central bank sold $400 million, the currency plunged 20%. Then the central bank was forced to urgently sell another $300 million before the USDARS closed at 40. Hence the dilemma faced by the IMF and Argentina: for the Fund it is essential to preserve to avoid sending a signal of weakness, and leading to a collapse in the local bond market. But for central bank head Luis Caputo, allowing the dollar to rise so quickly leads to an even worse outcome, generating fear among investors and accelerating the collapse of local assets. 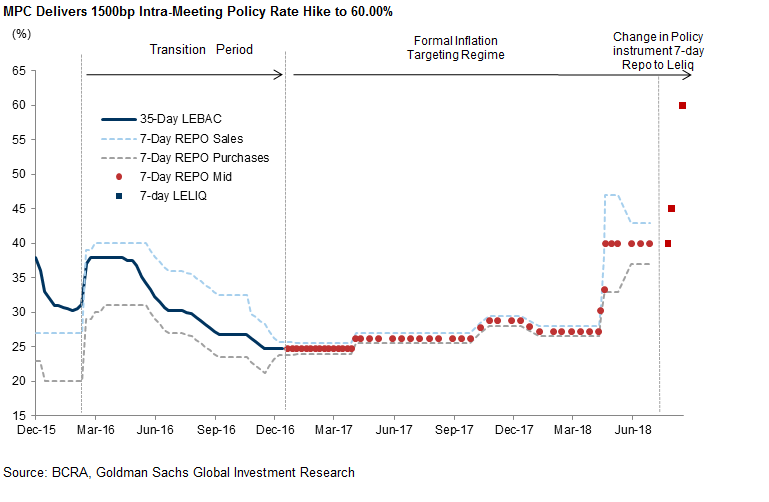 Meanwhile, the recent unprecedented rate hike became irrelevant, as it is useless to offer a 60% rate on pesos if the dollar rises 30% or 40% in a month. Therefore, to Argentina it is essential that the monthly devaluation be well below the level of rates in the coming months. Only then - the bank claims - it will be possible to attract investors who are willing to buy Argentine risk. "With bonds that yield 11% annually in dollars and bonds in pesos at 60%, it is the ideal time to awaken greed". But for that to happen it is necessary to ease the panic the behavior of the exchange rate. That won't happen if the IMF does not back off its latest position; in fact, if the market sees the peso as no longer having the support of the central bank, the ARS could disintegrate as soon as the Monday open, plunging by a record amount. This is why the president of the Central Bank, Luis Caputo, and his deputy, Gustavo Cañonero, scrambled to urgently get on the plane to the IMF's Washington HQ, where Finance Minister Nicolás Dujovne will also bepresent. The Argentina officials will go to Washington to convince the IMF authorities that they need much more leeway to intervene and calm the exchange market. 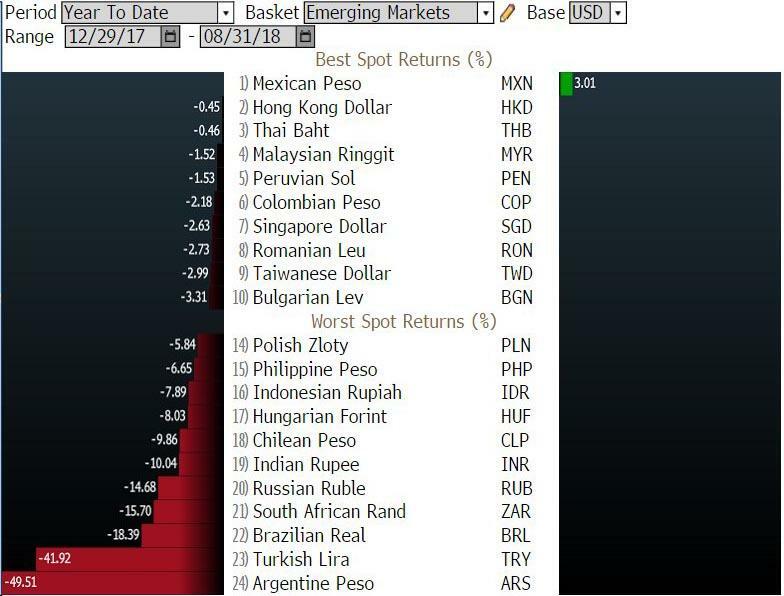 If they don't get it, the Emerging Market currency crisis is about to get far worse, and another Argentina default would be inevitable. As Infobae concludes, "it is an open-ended fight that is keeping in suspense not only the negotiators, but all the Argentines who will suffer the ravages of the mega-devaluation of the last month."